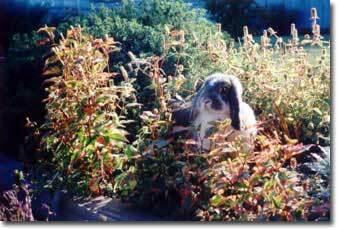 Scroll down or click here for "Rabbit Rescue Stories"
Having a rabbit is a great joy but one has to be very dedicated, conscientious, and knowledgeable. Given the proper care a rabbit can live up to twelve years. They are naturally very sociable, curious, and active. 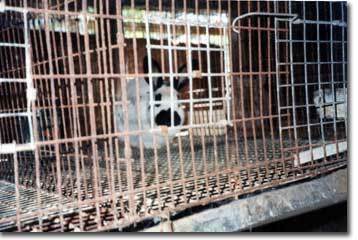 Therefore left sitting in a cage or hutch is unnatural, cruel, and lonely. This is not a life. One must consider a number of factors before bringing a rabbit into a household. l) A rabbit is not a toy and needs the freedom to freely move about. Cleaning the living area, washing dishes, litter pans etc. are part of the daily routine. 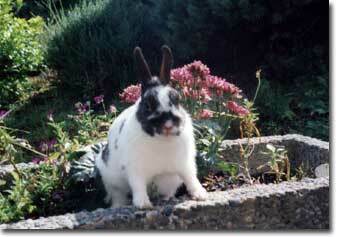 2) A rabbit needs to be litter trained, but this is not always successful. Accidents may occur so keep this in mind. 3) Finances must be available to provide visits to the veterinarian if necessary. Good quality food will help keep your rabbit healthy and if one takes a vacation planning ahead includes care for the rabbit. Not all vets are familiar with rabbits so check around. 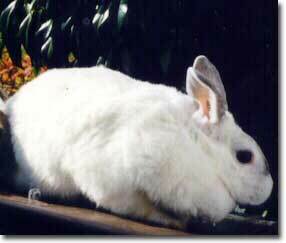 4) If there are other pets in the household an adjustment will have to be made so the rabbit can fit in. 5) Everybody in the family must want the rabbit and one must ensure that nobody has allergies. They are not "starter pets." 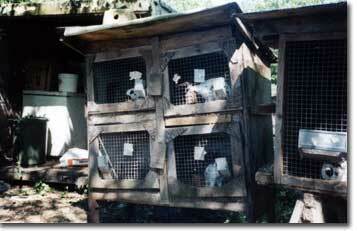 6) The house should be rabbit proofed since they like to chew on wood and electrical cords. They may also pull at the carpet. 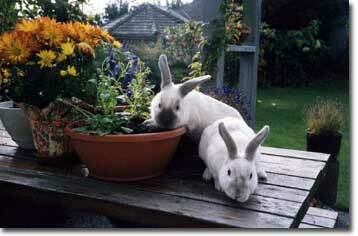 7) Have your rabbit spayed or neutered. There is an overabundance of unwanted rabbits at shelters or pounds and others that have simply been discarded to the outdoors. A female can become pregnant at any time except three or four days of the month. Spaying helps prevent cancer in the females. Neutering the male is an easier operation. Once altered they become a little calmer and the incidents of spraying become less frequent. Again, check to make sure that your veterinarian is experienced with rabbits. Before bringing the rabbit home make sure everything is ready. They require water, a commercial pellet mix, and hay. The hay helps prevent fur balls. Carrot tops, apples, parsley, and dandelion greens are among other foods that they enjoy. Nothing should be given straight from the refrigerator. Wash the foods with lukewarm water before feeding your bunny. Dwarf rabbits are naturally resistant and robust if the overall living conditions are good and they receive proper care. Their living quarters must be clean, dry, and away from drafts. Always be mindful of any change in the bunnies' behavior or appearance. Healthy rabbits are frisky, inquisitive, have bright eyes, and good coats. Animals are not possessions and treating them as such is unethical and unfair. We domesticated rabbits and if we desire to bring one into our home, respect, care, love, and understanding are essential. Remember that rabbits are sentient beings. They are very sociable and need attention. Unfortunately, too many animals are abandoned, neglected, and abused. Please be absolutely sure that when adopting a pet that you are prepared to give it the quality of life it deserves. 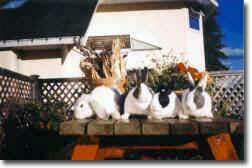 A good source of information is the House Rabbit Society. Shelters, rescue groups, and pounds are overflowing with unwanted rabbits. Give them a second chance. "A fresh obligation is laid on each of us to do as much good as we possibly can to all creatures in all sorts of circumstances." "The question is not 'Can they reason, nor can they talk, but can they suffer?'" 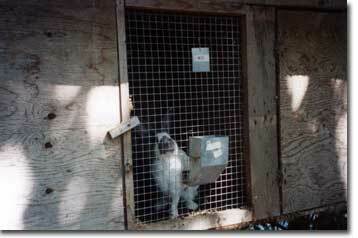 The following photos were taken by Carmina Gooch at a Langley rabbit breeding facility. 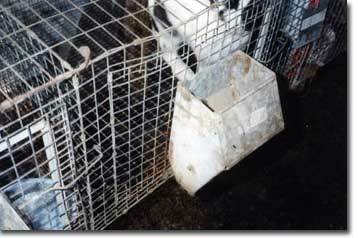 These tiny, dilapidated, corroded cages are typically used by rabbit breeders. 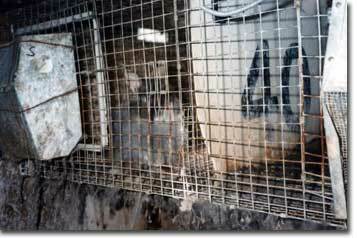 The animals have virtually no contact with people and are confined night and day. They stand on wire mesh with little room to turn around. Their sole purpose is to provide revenue with minimal expense to the breeder. 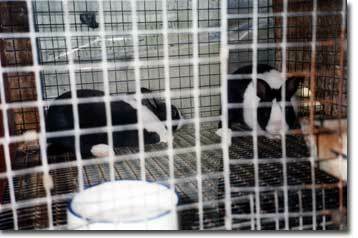 They are often sold at pet stores, where the conditions are equally poor, and the sole motive, once again is profit. Lucy came to us after we attended a rabbit show. She was a lop, and had garnered many prizes. The breeder was getting out of the business and just wanted to get rid of her stock. She said her remaining rabbits were going to be sold at an auction. We took her home, and for months she just sat in one corner. She had always been in a cage, and didn't hop at all. Finally, she realized that it was okay and began to enjoy life. 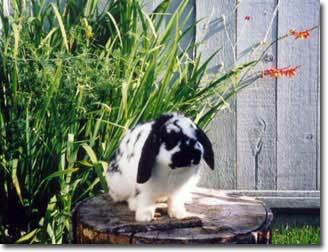 She would hop out to the garden, sniff around, and play for awhile, always returning to the den where she would lie down and rest. Sadly, she passed away in my arms a few months ago, but at least she had happy times with us. Rue & Shelby. 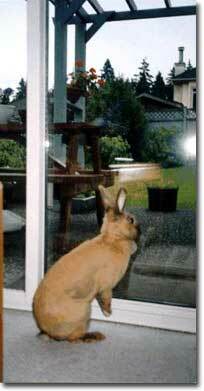 In the summer of 1999 I was contacted by a family in North Vancouver reporting two bunnies running around their yard. They had been there for a few days, and needed help catching them. I went over, and after a great deal of effort managed to get them into my car and home. These fellows were hungry and thin, but otherwise okay. Nobody came forward to claim them, which is predictable, as they were likely intentionally abandoned. They were shy at first, but came around, and remained the best of friends until their deaths late last year. 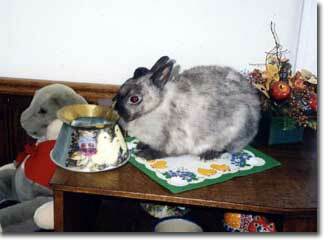 Nibbles was bought from PetCetera at 6 weeks of age by a teacher who thought a rabbit would be a good learning tool. By the end of the school year nobody wanted her so I decided I could take yet another one. The teacher admitted this had been a big mistake and there were many problems associated with having an animal in the classroom. Children would taunt the bunny, poke at her, and in general, make her life miserable. Kept in a tiny cage, she had nowhere to escape. After she arrived in my home the signs of trauma were obvious. This rabbit never recovered, and unfortunately died at a very young age. Petunia was another unwanted rabbit that ended up at the pound. When we viewed her she lunged at the bars of the cage and grunted. After observing her for a short time I decided to try to pick her up. Managing to do so, I tried to calm her down, but it was apparent she was afraid. We decided to take her anyhow, and on the way to the car she bit my husband. Her behavior didn't improve much over the next few months but she was friendly with a couple of other rabbits. Until her death she never trusted us completely, and she bore the scars of previous abuse until the end. Elfin is just one of the many rabbits that are abandoned or surrendered to pounds and shelters because they are no longer wanted. This little bunny was being dumped from a car near Shannon Falls. A concerned citizen managed to catch her as the vehicle sped off. That was one lucky rabbit. Domesticated house bunnies, dependent on food, shelter, and love from humans, would not stand a chance of survival in the wild. 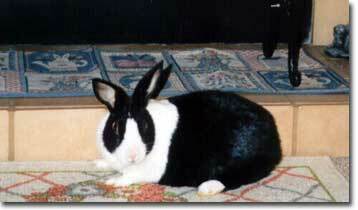 Now she is in our loving home with other rabbits that have survived similar circumstances. There are many other bunnies like Elfin that need a second chance at life. Charlotte is a cute little Dutch that was purchased at a pet store when she was six weeks old. In a matter of months the owner decided she was too much trouble. She was chewing at electrical cords and didn't always use her litter pan. This led the irate and cruel owner to abuse her, before she was rescued. When Charlotte first came to our home she was extremely fearful and aggressive. She didn't want to be touched and would bite. Many months of hard work and love paid off. She made friends with other bunnies and discovered that all humans aren't so bad. Today she gets to hop around the den, and lay on the bed, although she continues to keep her guard up. Cinnamon is a four year old dwarf bunny, who along with his brother was given away at seven weeks old. 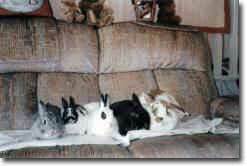 The people who owned them had let their adults mate, and didn't want to have rabbits anymore. A family took the two young ones home in July and by September the kids were losing interest. 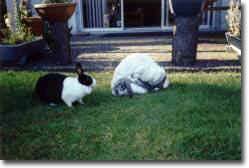 They were back in school, and the rabbits were put in a tiny enclosure in the backyard. A neighbour contacted me during the winter, informing me that Cinnamon's brother had frozen to death and the people were moving. If nobody wanted Cinnamon in the next few days he was to be let loose. 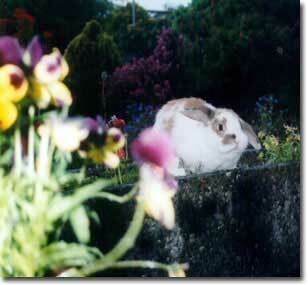 Of course I took him and he has enjoyed life with his bunny pals and us for the last three years. Sara had been brought to the SPCA at approximately 3 years of age. She had never been let out of her cage and was severely overweight. We took her home and set up a room where she could freely move about. However, she had resigned herself to a life of quiet desperation, and never overcame her past. One evening she just slipped away peacefully in my arms. Nellie was used for breeding purposes in Cloverdale. She had already had several litters when we purchased her. I asked the woman what happened to the rabbits that didn't find homes. She said they were released on the property and after awhile just "disappeared." Although there was no real demand for rabbits, she kept at it for several years, until the family got a dog, and decided it might be an idea to breed her.